Our annual trip to the beach is a major highlight of the year for our boys. Having just returned home from this year’s trip, I’ve got beach on the brain! So here’s a list of our favorite children’s books about the beach. These are the books we read in the days leading up to the big trip each year. Reading about all the things we may see and experience at the beach just adds to the boys’ excitement. And each year we seem to discover a new favorite title or two. 1. Hello Ocean is a long-time favorite at our house. It explores many aspects of a trip to the beach, all revolving around the five senses, with beautifully painted, photo-like illustrations. 2. Each of our boys has loved All You Need for a Beach, especially around the age of three. With fun, rhyming text and playful illustrations, it also explores typical aspects of a day at the beach. 3. The Seaside Switch is a fabulous look at the tides, with detailed illustrations. Older Brother loved spotting the little boy’s sketches throughout the story. 4. What Lives in a Shell? provides a wonderful overview of creatures with shells, including those you might encounter at the beach. Both boys (3 and almost-7) were captivated by the pictures and descriptions in this informative book. 5. Margaret Wise Brown, celebrated author of Good Night Moon, The Runaway Bunny, Big Red Barn and many more, has an entire “Noisy” series. 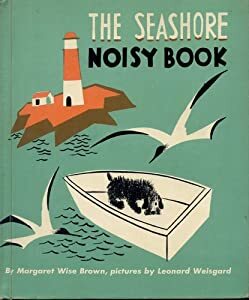 This Seashore Noisy Book is a winner! My boys loved Muffin the dog, as well as the interactive format of the text–lots of questions! 6. By the same author as My Spring Robin, At the Beach is a simple tale of a little girl’s day at the beach. Little Brother (3) especially loved this one. 7. Time of Wonder is best suited for older kids who can sit still for the lengthy text. McCloskey is a favorite author at our home–we also love Make Way for Ducklings and Blueberries for Sal, among others. 8. Miranda’s Beach Day is Little Brother’s current favorite. Such a sweet story of Miranda’s first trip to the beach, with a poignant ending. The book’s last page includes an interesting explanation of Keller’s illustrative techniques. This title isn’t a story but it’s a great little guide to take along to the beach, or to read in preparation for your trip. We love the Take Along Guides series! Harry by the Sea by Gene Zion is a definite “must add” to the list.